I am surprised that Goldsmith made no attempt to unravel the non sequiturs in some of Egerter’s responses in the first exchange. 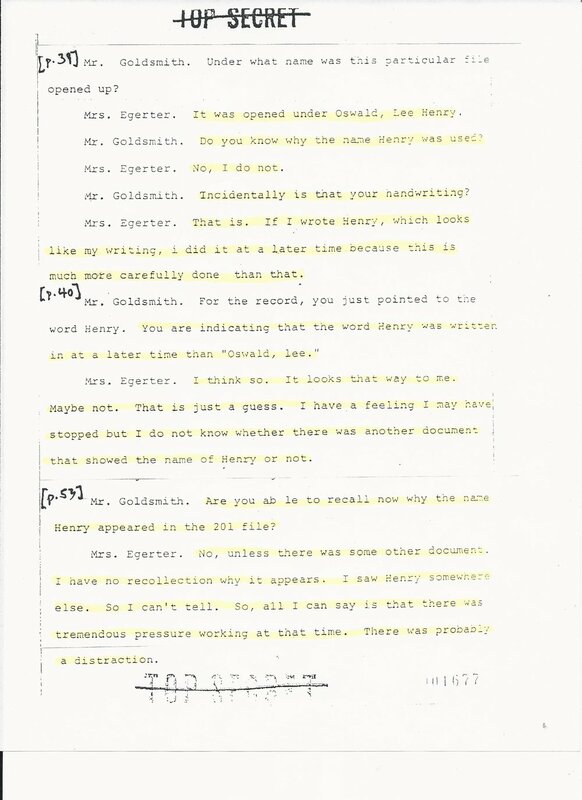 I am just as surprised that Goldsmith did not ask Egerter about the other document she might have been looking at that led her to change Oswald’s middle name. An important opportunity was missed, as Goldsmith changed the subject by turning to many other details on the 201 opening sheet. The second exchange was another picture-perfect opportunity to press for more information on what this other document might have been. But Goldsmith, apparently satisfied with those three choices—another Henry document, pressure, and distraction—did not seize the opening. Another opportunity was missed. I might add, that if the name Henry on the index card was taken from the 201 opening sheet, it renders suspect Egerter’s statement that she added the name Henry to the opening sheet later. We know for certain that the middle name Henry was in the biographical information on Oswald (discussed above) sent by CIA to the State Department on 3 November 1960—five weeks before Egerter opened the Oswald 201 file. That document was undoubtedly examined by the HSCA but, curiously, Goldsmith did not ask Egerter about it. It now appears certain that Egerter had her own 3 November 1960 false biography and Stacy’s May 1960 legitimate biography in front of her on the day that she prepared the 201 opening sheet on Oswald. And it is unlikely that she was distracted or under intense pressure on the day of the 201 opening. Moreover, her use of the middle name Henry twice in her 3 November biography renders suspect her testimony that she put Henry on the 201 sheet later, on 9 December 1960, when she saw the name Henry on some other document. What Goldsmith failed to ask Egerter is where she got the Henry name from when preparing Bissell’s 3 November 1960 reply to the State Department. The “other” document with the middle name Henry was the Oswald biography the Egerter prepared for the State Department! When she used it to open Oswald’s 201 file she did not do it because she was under pressure or distracted. She knew exactly what she was doing. She lied to Goldsmith about this key information in her sworn deposition--perhaps to avoid acknowledging that Oswald had been used operationally in the hunt for Popov's mole. The opening of a 201 file on Lee Henry Oswald on 9 December 1960 indicates a major change of status for Oswald had taken place. This change of status had been anticipated before Oswald's October 1959 defection could explain why he never returned to the Moscow Embassy to execute the oath of renunciation of his American citizenship.